We are pleased to offer a variety of services specific to your dental needs. Click on a specific service to learn more about what we offer. Regular preventative cleaning and exams are an important part of an oral care regimen. A dental cleaning helps eliminate plaque and calculus from the mouth preventing periodontal disease and other systemic conditions. Regular dental exams and x-rays are a critical component of preventative care as they help detect any problems before they have time to become more serious. 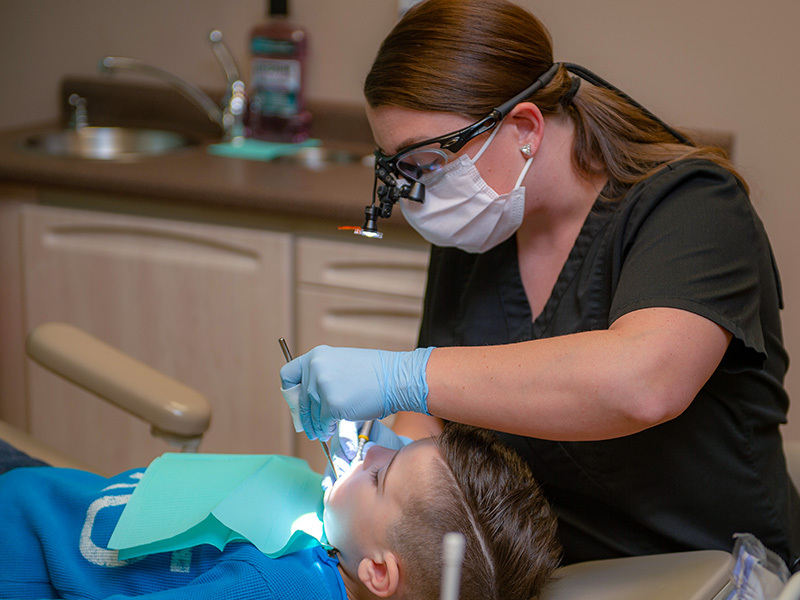 Scaling and Root Planing, also known as deep cleaning, is the removal of dental plaque and calculus below the gumline and planing of the root surface to remove toxins that cause periodontal disease. Our trained dental team will access the soft and hard tissues of the oral cavity to detect any abnormalities. Routine dental exams can allow us to access even the smallest changes from one recall visit to the next. Sealants are a preventative procedure used as a barrier for deep pits on the biting surface of molars, and pre-molars. Restorations are placed in a tooth after a cavity is removed. Patients have several choices when it comes to materials to repair worn, damaged or decayed teeth. Root Canals are necessary if a tooth becomes abscessed and the patient wants to keep the tooth. The infected nerve is removed and the chamber is disinfected and filled with a plastic sealer so that the patient may retain their natural tooth. A tooth-shaped “cap” to restore function and appearance to a tooth that is broken down or weak. It can also be used to cover teeth that are discolored or misshaped. Despite the best intentions, teeth sometimes need to be removed. Our team will work with you to alleviate fears during this minor surgical procedure. Bring the whole family! From preventative care to fillings and extractions, we can handle most needs of your little ones as well. We are a family dental practice! Traditionally this has been the primary way of replacing a single missing tooth. A bridge is a series of connecting crowns that is cemented on either side of the edentulous area. If you have lost all your natural teeth, complete dentures are used to restore your smile and ability to chew food and speak. Partial Dentures are removable appliances used to replace several missing teeth. Most partial dentures are made with a metal framework with teeth and pink acrylic gums. Implant crowns are cemented or screwed on a previously placed dental implant or titanium screw. They can be used to replace a single tooth, as a component of a bridge, or anchors to retain a complete denture. Veneers offer a way to close gaps or change minor misalignments in your smile. Veneers are thin porcelain coverings that adhere to the teeth to help you achieve the look you desire. Professional whitening systems provide superior results to obtain a bright, white smile. We offer a variety of take home solutions to keep your smile looking it’s best! Very caring dentist. Staff very friendly. Explained everything she did. Would highly recommend. This staff is amazing. My daughter was so scared of the dentist before we found Dr. Brandi! She goes above and beyond when it comes to her patients! Her staff is an amazing group of caring and empathetic people. Loren is an awesome hygienist! Dr. Brandi is also amazing when I had my very first crown done on my tooth she didn’t settle with anything but perfect and I am so thankful and impressed with the way my crown looks. We accept a wide range of dental insurance plans. ©2019 Brandi Howard-Stickel & Associates, DDS, LLC.